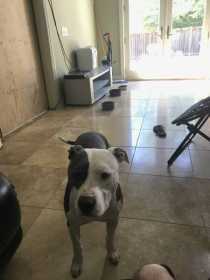 Hello, Please contact me if you have found a lost gray and white male pit bull terrier weighing about 55 lbs. He is neutered and very friendly. He got out today (1/17) through a damaged fence after the rainstorm at our property on Cypress Avenue. Please email or call me if you have him or have seen him recently!